One major issue most new parents face is lack of sleep, as their cranky newborns keep them awake through the night. Scientific research has proved that new parents can rarely expect to get more than five hours of sleep in a night. This adds up to losing as many as 44 days of sleep in a year. Many infants magically calm down when they are taken for a drive by their mum or dad. A nighttime drive and the soothing, rocking motion of the vehicle is sometimes more effective than the most loving hugs from mum and dad. Ford engineers, in association with the studio Espada y Santa Cruz have helped design and develop a cot that mimics the motion, the engine noise and even the ambient street lighting of a night-time drive. When it comes to appearance, the cot is like a regular cot. However, Max Motor Dreams can be operated through a smartphone app to record and then replicate the soothing movement, lights and sounds associated with a particular journey. 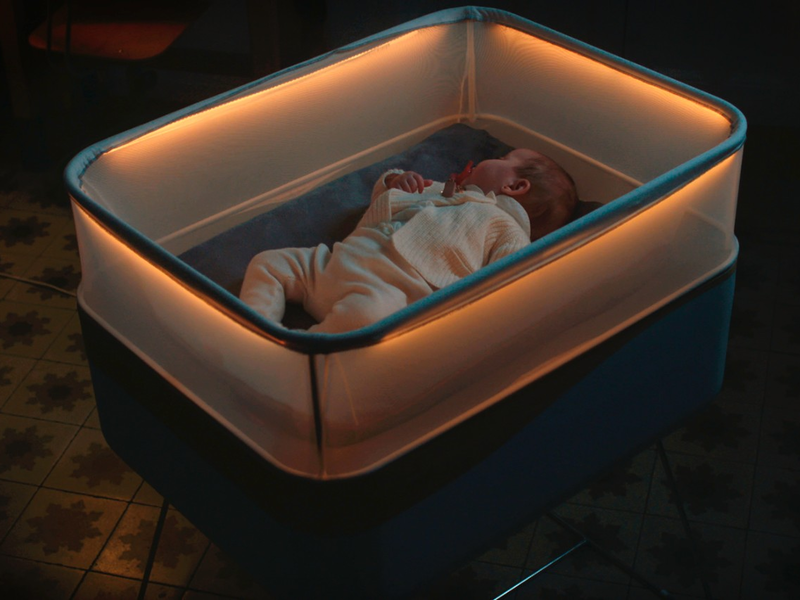 Max Motor Dreams designer Alejandro López Bravo, of Spanish creative studio Espada y Santa Cruz, which produced the award-winning design said that the company spent many years talking to mums and dads to learn how sleep deprived new mums and dads are. Though a quick drive in the family car can definitely lull a baby to sleep, the parents would still need to be alert while driving. Max Motor Dreams eliminates the need for this and will go a long way towards making the life of new parents easier. Currently, the Max Motor Dreams is a one-off pilot. But after receiving a lot of interest, the the company is seriously considering full-scale production of the unique cot.